Computer scientists at MIT have teamed up with surgeons at Boston Children's Hospital to develop a system that can take an MRI scan of a patient's heart and convert it into a physical model, meaning surgeons can get a better idea of what they're working on. MRI scans use magnetic resonance to collect a series of cross-sections of a three-dimensional object. Each of those cross-sections have light and dark areas, and some of the time those boundaries match the edges of anatomical structures. Some of the time, however, they don't. Creating a 3D model out of an MRI scan, therefore, is a bit tricky. In the past, that's been solved by getting doctors to manually mark the boundaries but that takes time and effort. Instead, The MIT researchers built an algorithm that has some knowledge of what a heart tends to look like. It then knows when it should be expecting a ventricle or aorta. But a difficulty with that approach is that many heart patients are in hospital because their heart is abnormal in some way. So the teams combined both approaches - getting humans to identify a few of the boundaries and letting the algorithms take care of the rest. In tests, the best results came when humans identified boundaries in just a small patch of each cross-section. By manually segmenting 14 of those patches, the computer was able to almost match an expert's rating of 200 patches. "I think that if somebody told me that I could segment the whole heart from eight slices out of 200, I would not have believed them," said Polina Golland, who worked on the algorithm. "It was a surprise to us." The segmenting process takes about an hour, and the 3D-printing process takes a couple of hours more, meaning the system can go from an MRI scan to a physical model in less than an afternoon. Its effectiveness will be assessed in a clinical trial in the autumn, involving ten patients that have already received treatment. Surgical plans made from the 3D models will be compared with the plans actually used to try and quantify the size of the benefit it gives, but doctors are already excited. 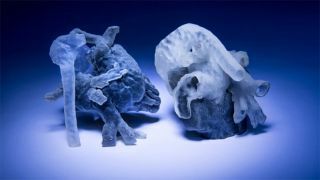 "We have used this type of model in a few patients, and in fact performed 'virtual surgery' on the heart to simulate real conditions," said Sitaram Emani, a cardiac surgeon at Boston Children's Hospital, who wasn't directly involved in the research. "Doing this really helped with the real surgery in terms of reducing the amount of time spent examining the heart and performing the repair."